Ruzafa, a barrio located to the south of Valencia city centre, has, at least for the past 3 years, been a neighbourhood frequented by cool kids, hippies and self-proclaimed artists. 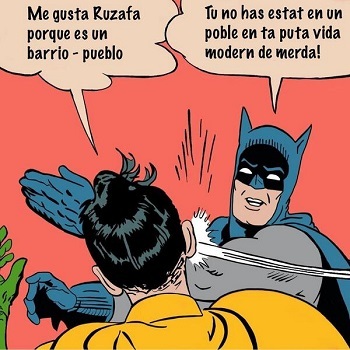 Before becoming it’s “up and coming” self, Ruzafa was previously a neighbourhood primarily inhabited by Latin American, Maghrebian and Chinese immigrants. Ruzafa’s new identity is reflected in the amount of quirky bars, vintage shops and alternative nightclubs that now populate the streets. Because of it’s arty-farty reputation, Ruzafa also boasts many examples of street art. One artist that springs to mind is Vinz Feel Free who specialises in what are sometimes nightmarish splicings of naked women and bird’s heads. In fact, here is a project that’s just been posted on his Facebook today. 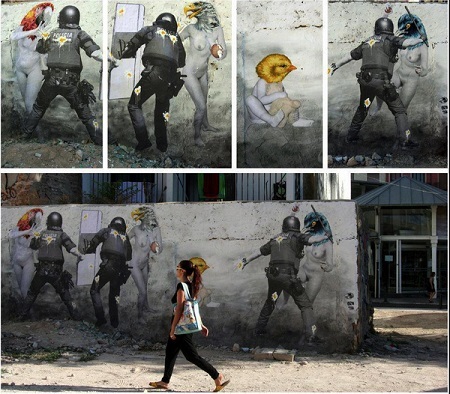 No stranger to the press, one of Vinz’s murals in the old town made the pages of El País last year after policemen were filmed ripping his art from a wall. Despite the last two examples of his work not being within the boundaries of the barrio, I assure you that you will not be able to walk through Ruzafa without being confronted by some kind of avifauna with lady’s bits. 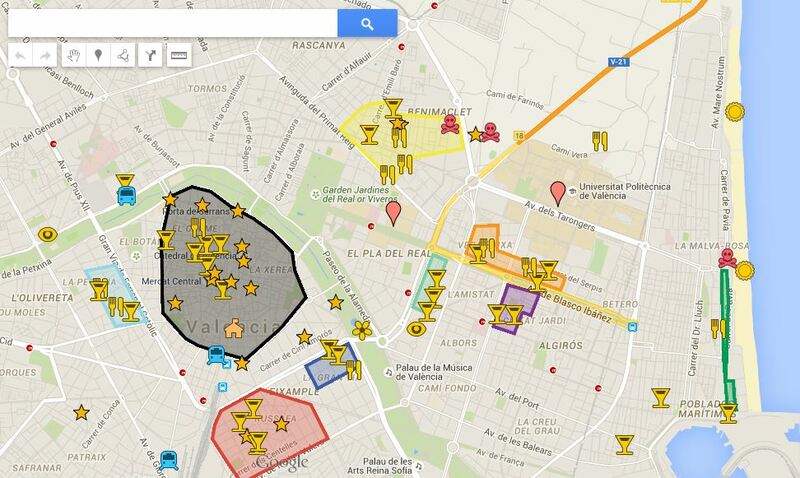 The area seems to be a true supporter of the quinto-tapas-montadito ideology. Walk down Calle Literato Azorín and try to not be enticed into nearly every bar on the stretch. One of our favourite bars in the area is El Rojo – cheap beer and cheap-yet-delicious montaditos mean that if you plan going here you either need to turn up early or be prepared to queue for a table. Just across the road is Ubik Café, a “restaurante-librería” that sells Alhambra in bottles and invites you to browse and buy books that line it’s walls. Despite being frequented by the the odd MacBook Wanker and being über-yah at times (christ, their Facebook profile picture is a photo of a fixie bike), it’s a lovely bar all the same. Slaughter House on Calle Denia well and truly fits the quirky bar bill, and not only because of the way the Spaniards pronounce it’s name. Original floor tiles and meat hooks still adorn this bar from when it used to be a butcher’s shop. Tasty tapas, the art-deco Estrella Galicia beer pumps and rows of bookshelves give it a winning touch. The demise of nightclub Excuse Me came at around the same time as the XL Playground opened, a pop-indie-electronica-dance club that closes at around 4am. From here you have a couple of options: Play, from the same owners as XL, or Nylon, specializing in hits, rock, “indietronica and tropical beats”. Close-by is La Posada de Las Animas, the younger sister of the port’s super club catering for all you mami lindas and electro latinos. The vibe that Ruzafa, or Russafa in Valencian, gives off is a relaxed one. Life is slow, calm and, in true stereotypically Spanish style, quite laid back. There is a definite difference that one notices in Ruzafa when compared to some of the other, more hectic parts of Spain’s third largest city. This often brings people to make snap judgements about the barrio, much like this one that’s perfectly illustrated by Batman and Robin. Much like other barrios, Ruzafa has its own market. It is similar to the Mercado Central in that fresh, locally sourced produce is available most mornings, although obviously on a much smaller scale. Naturally, the market is also surrounded by even more bars, cafés and even a church which makes Ruzafa a picturesque hotspot for people of all ages. And, of course, we cannot write a piece on Ruzafa without mentioning one of the biggest fiestas of the year and the great part that this multi-cultural neighbourhood plays in it: Las Fallas. Locals and “adopted locals” (Read: guiris that have been here a while) will be well versed in just how crazy Ruzafa gets during Valencia’s most fiery fiesta of the year. Cut off from traffic, the whole area transforms into a pedrestrianised free-for-all with thousands of people passing through to see some of the biggest Fallas in the city, often on the corner of Calle Literato Azorín with Calle Sueca. Head to Calle Cuba and further up Calle Sueca to see the breathtaking light displays. Some pieces of advice, though: don’t go to Ruzafa in peak Fallas-watching times or you will likely get stuck in a relentless human traffic jam. Also steer clear of the kids’ firework zones. Again, forget anything you think you know about health and safety. Ruzafa is located in the red area of our map of Valencia below. Have a click to look around. Get to Ruzafa via the red (L3) or green (L5) metro lines, alighting at Xàtiva and crossing over Gran Vía Marqués de Turia.